F.B. & I both love animals. So I thought I would share some of our pets! Popcorn: Popcorn is my cat. She will be 15 years old in July. We got her when I was 10 years old from the Philadelphia PSPCA. She sleeps on the end of my bed every night. We named her Popcorn because when she was kitten, she would eat popcorn. hehe. I think she is a color point or calico cat. Coco: F.B. 's family got Coco (Coconut) about a year ago. I got to meet him in January this year. He's very friendly and doesn't bark too much. He's a silly dog! He's still a bit of a puppy. When Ate Malou would put him in the garage in the evening, she would pick him up like a big baby. She said he was a spoiled puppy, hehe! I think he is a mix between purebred dog & a mutt. He is more F.B. 's sisters dog. Pusa: (Cat in Tagalog.) 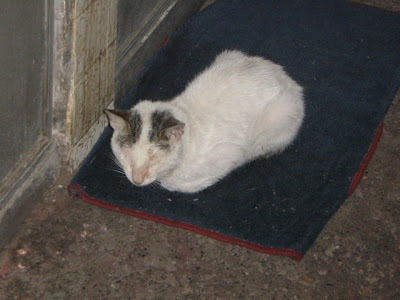 Pusa is a stray cat. He is also a dirty cat. But he is very friendly and loveable. He always hangs around F.B. 's house. I got to meet Pusa in January. He loves to pet and scratched on his head. He also LOVES food. He would meow the silliest meow when we were eating lunch. We would feed him the leftover scraps. Pusa really loves F.B. The one night we were putting Coco in the back yard and Coco started barking, Pusa walked all the way out back, looked around the corner of the house at F.B., Coco & I and went "MEOW?" As if saying, "What is going on out here?!" One time he managed to get into F.B. 's house and his sister found Pusa curled up on her bed! Haha! 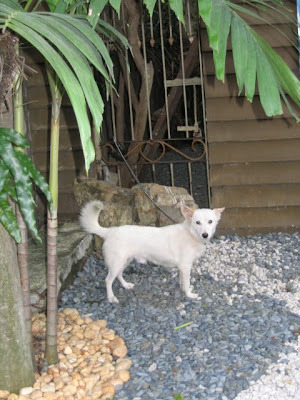 There are alot of stray animals in the Philippines, where ever we went we usually saw stray cats and dogs. I remember being in Manila and coming out of Starbucks with F.B. and seeing a cat curled up on the sidewalk. I would always point out all the cats and dogs we saw while driving or walking around. I can't help it, I like animals, hehe. There was another stray orange cat that would come around to visit at F.B. 's house also. 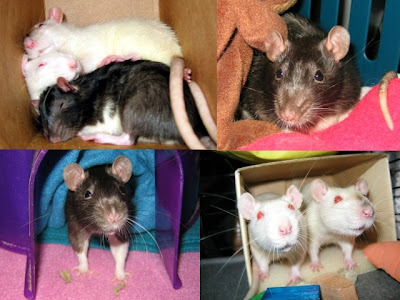 My Rats: I got my first two rats Sugar & Spice back in October 2007. I got my newest rat Cinnamon in February 2008. 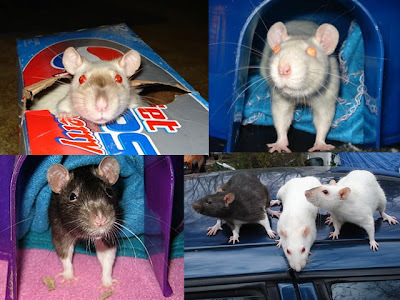 I've always loved rats and mice but never owned any until last year. I had a Ferret for 4 years and after she passed I didn't want to get another Ferret so I decided to get rats. While reading & researching I also discovered you can litter train rats! 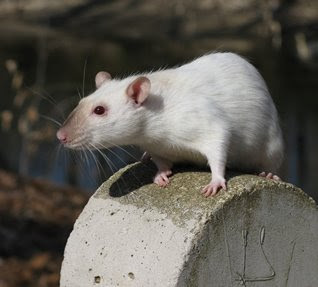 Rats are very intelligent creatures and some say they are as smart as a 2 year old. They are very curious and affectionate animals. They will make you laugh at their antics! Rats love affection just like any other animal. They are very social animals. They will let you pet them, kiss them, scratch their heads. My girls have even learned their names and will come when called! Description: To be as white as possible, devoid of creamy tinge or staining. Eyes pink. Sugar is my cautious girl. She gets scared easily sometimes. She likes to weave her head back & forth to see better. She has the loudest sniffer you ever heard, hehe! You can hear her sniffing from across the room! She's also my chunky girl, she's bigger than Spice & has the cutest little belly! She also doesn't mind kisses. When she eats she will sneak out of the bed look around, run and steal a piece of food from the bowl look around then run and go hide to eat. She'll repeat the same process for every bite of food! She likes to hoard treats in her bed. She also loves to spend a great deal of time fixing her blankets just right, pulling and pushing them with her teeth and paws. Sugar never sits still long enough for you to pet her. Description: Body color to be white, free from stains and even throughout, with points a rich dark sepia. Eyes red. Note - Colour areas: 1. face - not to extend upwards from eyes. 2. ears - not to extend downwards from the base. 3. forelegs - not to extend upwards beyond the elbows. 4. hind legs - not to extend upwards beyond the ankle. 5. tail - not to extend beyond the tail root. 6. feet - to be solid colour throughout, devoid of any white. Spice is my troublemaker. She likes adventure. She's more active than Sugar. She's also smaller. She loves to pile everything & anything she can find in the cage in front of their bed. She'll also get exasperated with you when you straighten things up. She likes things a certain way. If you try to put a ball or a wood chew in the tissue box or bed with her she will throw it right back out at you! If you keep it up, she'll sit there- give you this "look" (Left eye open, Right eye squinted) & give a great big *huff*. If you try to kiss her, she'll use her paw to push you away. Spice also loves to chase Sugar around the cage and annoy her. She's an antagonist. Spice will let you pet her & scratch her head until she falls asleep on you. Then she will grind her teeth & make her happy noises. Spice also loves to explore she will tunnel through my blankets on my bed. And she's loves to jump and climb. She can jump several feet sometimes! She is very quick and you have to keep your eye on her or she will escape. Description: To be symmetrically marked, with as much white on the chest and belly as possible. The white shall not extend up the sides of the body, the edges shall be clear cut and devoid of brindling. Back feet to be white to the ankle, forelegs to be white to half the leg. Tail to be white to half its length. The body color shall conform to a recognized color variety. The white area shall be pure and devoid of any color or staining. A white spot on the forehead is desirable. Cinnamon is my hyper active baby! She is constantly on the move, jumping, running, sniffing. She never sits still (until she's asleep! Or chewing on something!) She is the most affectionate of all my girls. She will climb up on my neck and sniff in my hair or cuddle on my arm. She's is my antagonist. Cinnamon is my youngest rat but she is now the alpha rat. 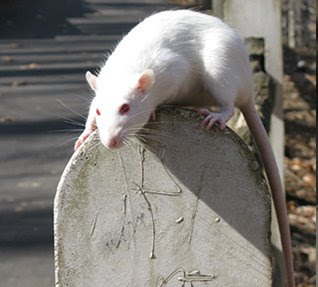 It took her a little while to establish that role, because Spice used to be the alpha rat. Cinnamon loves to chase Sugar & Spice all around the cage. She just loves annoying them! She is very curious & also an adventurer like Spice! Sometimes When she's sniffing really hard it sounds like a duck! And she's turning into a little butterball! Cinnamon is not shy about eating or where she eats. She will walk right up to your bowl or plate and if she likes something she will steal it off your plate. 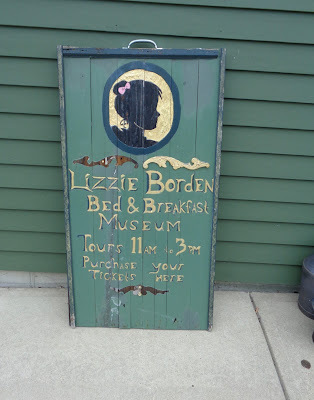 She once tried to walk off with a whole piece of fried chicken! She's my troublemaker. So far she has chewed a hole in my laptop wire, camera wire, my new sony camera wire & a PS3 control. That's her bad habit. You really have to keep an eye on her! 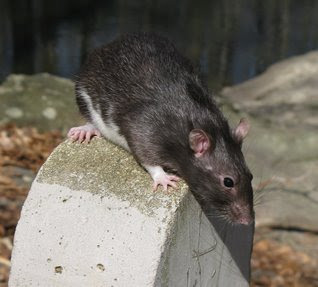 Please come and check out the Rat Chatter Forums if you own rats or are interested in getting some. This is a great community! I feed my girls a mix diet that I make myself. It is healthier and cheaper than buying a pet store brand. This also works, because I eat alot of plain cereals so I can feed myself & my rats with 1 box of cereal. Sunflower Seeds (in shell or without). I also give my girls veggies and fruits as treats sometimes. Some of their favorite foods are: Apples (without seeds) Strawberries, Applesauce, Fruit Yogurt, Peas, Spinach, Tuna, Salmon. They also love the whipped cream on Starbucks Frappucinos & Rice Crispy Treats occasionally. Another favorite treat of my girls is dried chicken leg bones. I let them dry overnight before giving them to the girls to chew on. It helps their teeth. They Love them! They go through them pretty fast!